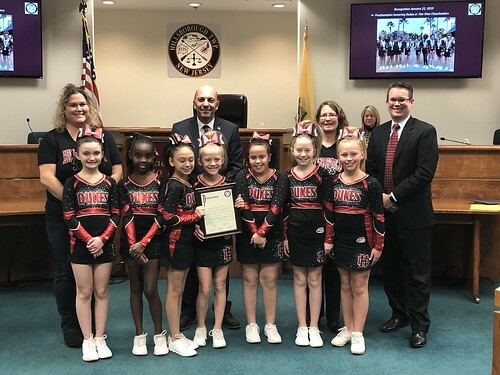 At the January 22nd township Committee Meeting, the Mayor and Township Committee recognized the Hillsborough Dukes Jr. Pee Wee Cheerleaders for their successful season due to their hard work, dedication, and commitment to the sport and to those principals of good sportsmanship, teamwork and academic achievement which the organization endorses. The Dukes Jr. Pee Wee Cheerleaders were Jersey Valley Conference Cheer Champions, New Jersey State Champions, Eastern Region Pop Warner Cheer Champions and received second place at the Pop Warner Cheer Nationals at Disney. The 2018 Hillsborough Dukes Jr. Pee Wee Cheerleaders consisted of the following young athletes: Isabelle Antonelli, Molly Campbell, Gianna Carlson, Jayla Chaparro, Jules DiNuzzo, Samantha Grohe, Reagan Kenney, Caydence Pinkett and Sophia Rollan. The squad was led by Head Coach Catherine Grohe, Assistant Coaches Kelly Kenney and Kelly Black and Student Demonstrators Amy Applegate and Gillian Prince.